A pair of gables, twin dormers and a cozy front porch add interest to the facade of this spacious, yet economical home. Note how the arched picture window is echoed in the arched dormer windows, the arched transom above the front door and the arched openings of the welcoming porch. This home features a partially vaulted foyer, illuminated by a clerestory dormer window. 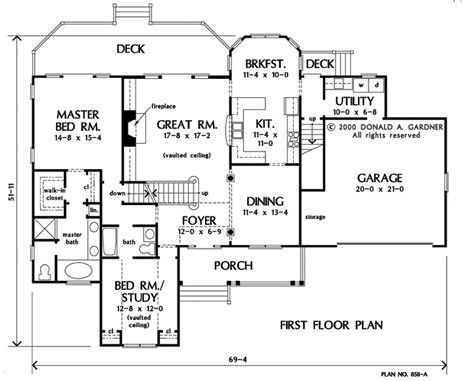 Vaulted ceilings add space and stature to the great room and bedroom/study. Built-ins enhance living space in the great room, while a pass-thru from the kitchen makes entertaining and day-to-day life easier for the whole family. 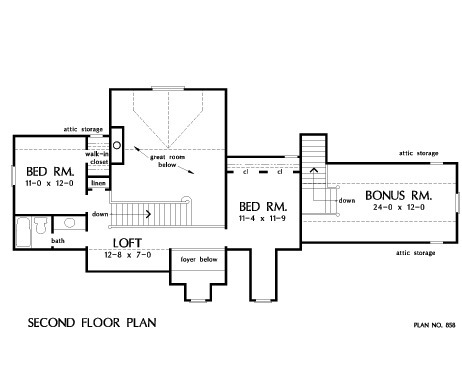 A short L-shaped hall provides privacy for the master suite, while a loft and balcony that overlooks the foyer and great room separate the two upstairs bedrooms. 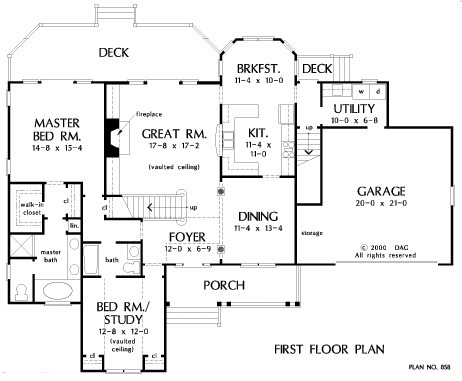 House Dimensions: 69' 4" x 51' 11"
Great Room: 17' 8" x 17' 2"
Master Bedroom : 14' 8" x 15' 4" x 9' 0"
Bedroom / Study (Vaulted): 12' 8" x 12' 0" x 13' 0"
Bedroom #4 : 11' 4" x 11' 9" x 8' 0"
Porch - Front : 20' 11" x 6' 6" x 0' 0"
Deck / Patio : 33' 0" x 9' 0" x 0' 0"
Deck / Patio #2 : 5' 9" x 4' 2" x 0' 0"
Loft / Study (Clipped): 12' 8" x 7' 0" x 8' 0"
Balcony : 8' 8" x 4' 0" x 8' 0"
Foyer (Vaulted): 12' 0" x 6' 9" x 18' 0"
Dining Room : 11' 4" x 13' 4" x 9' 0"
Great Room (Vaulted): 17' 8" x 17' 2" x 18' 0"
Bonus Room (Vaulted): 24' 0" x 12' 0" x 8' 0"
Garage Storage : 4' 0" x 9' 0" x 0' 0"